Heavyweight: Stooke tipped the scales at 18st at the age of 20! My old man took me to his club, Evesham, when I was about ten. I hated it until we started playing games and rolling round in the mud. I went from there to Bredon, then Stow-on-the-Wold and they got me a Gloucester trial when I left school. Have you always played in the second row? I played anywhere in the team until I went to Hartpury College, then I settled at lock. What representative rugby have you played? England U18 and U20. I dislocated my elbow in this year’s U20 World Cup semi-final so I couldn’t play in the final, which I was gutted about. The U20 set-up is a great and I will miss it this year. What are your aims now? To play regularly for the Gloucester first team. I didn’t think it would happen this fast (Stooke made his first Premiership start v Northampton in September and his first Heineken Cup start last month) but I’m loving it. What was it like scoring a try against the Saints? It was an unbelievable game. I was only a couple of metres out and I just flopped over. Do you live with other Gloucester players? I live with a group of academy boys in what’s called the House of Pain, right opposite the ground. We are all training together and are trying to break through. I am still an academy player so my aim is to get a full contract. RW verdict: This 18st 20-year-old has quickly earned the confidence of the coaches at Kingsholm. This Hotshot was published in the December 2013 edition of Rugby World. 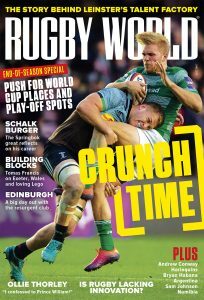 We feature the hottest youngsters every month – why not subscribe to RW to keep up to date? Click here for the latest deals or find out how to download the digital edition here.